What Makes The Best Aquarium Heater? With such weight attached to the right heat we need to ensure our heaters can really be more than just a hot stick in the water. 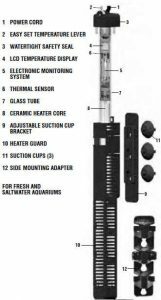 Adjustable heats, auto shut off features, shatter resistant materials and precise temperatures are what I have sought out to find best aquarium heater on the market. A few other factors to keep an eye on are the life time of the heaters, resilience along with their warranties. For this guide I have selected the best aquarium heater choices for large aquariums, medium household aquariums and small fish tanks. A consistent supplier of excellent craftsmanship, Aqueon has set the standard with this low cost and highly reliable submersible aquarium heater. The heat reads in Fahrenheit and is perfectly consistent but runs 1 degree cooler than what it is set to. The Aqueon features a life time warranty.Usually equipment will breakdown right when the warranty ends. Aqueon is one giant step above the rest of the competition here, allowing owners repairs and replacements whenever they need them. A long warranty does not mean faulty equipment. The Aqueon Pro Heater actually has several new safety features you wouldn’t notice until something went wrong. The heater automatically shuts off when removed from water, restarting when submerged in water. No risk of burning your hands when moving the heater around. A no glass design keeps the heater from shattering from small drops and quick temperature changes. 5 Sizes ensure your tank is never fried by an oversized heater. Sizes range from 50 watts to 250 watts. For setting the heat a standard turning knob is located at the top of the heater, complete with number readings to show you where your water will be heated to. Underneath the rim lies the red indicator light that switches on and off signaling when the heater is in use. To attach the heater to your tank a set of suction cups comes with the heater. These will hold under even my powerful 1k gph power head’s water flow and allow you to angle the heater however you like. Sometimes a diagonal is needed to fit behind those odd shaped rocks. One of the more high tech looking heaters, the Fluval E Electronic Heater is a strong component ready to make its tank successful. The wattages available range from 50 watts to 300 watts, letting the Fluval fit into any aquarium. Really this is the best aquarium heater with a more modern look. The biggest draw to the Fluval is its LCD display. Not only does it constantly update in an easy to read numerical display, the display even gives indications of any problems the tank could be experiencing. While the water is the right temperature the light stays green. When the screen changes color the temperature is not what it is set to. If the screen turns red the water is too hot and the heater is not on and if the screen turns blue the water is cold which turns the heater on. You should only really notice this when first installing the heater or during extreme weather. Remember heaters don’t lower heat. In cases of extreme temperature swings the screen will begin flashing, immediately alerting the owner to any problems. Should the Fluval lose power the temperature settings will be saved and resume upon receiving power. No cold/melted fish after a midnight blackout. With all these temperature safety features you may think the temperature is holds is inconsistent. The Fluval actually effectively combats this fear by equipping itself with two temperature sensors. This gives the Fluval an even more precise reading than all single stick heaters that can only rely on one reading and keeps your tank safe in the event of hardware failure. To safeguard against any kind of failure or damage, all Fluval heaters come standard with a long five year warranty. Any breaks, failures or faulty parts will be replaced or refunded by Hagen, Fluval’s company, themselves. Be sure to keep track of your proof of purchase, which can be anything from a receipt to the order conformation email. To allow for the most precise temperature changes available the Fluval comes with a lever rather than a knob. This lever changes the degrees in .5 degree increments, removing the “close enough” feeling that knobs and dials can create. To make the temperature even more precise the Fluval uses an internal thermal sensor, which is as accurate as an external water probe. Most heaters simply sense the internal air temperature which can cause the heat to fluctuate throughout the day. Adding on even further is the heaters low flow sensor. If the Fluval determines that the heater is not receiving enough water flow the screen will display LF on the screen. simply put the Fluval lets you know when it is not in an optimal position. Because of all these features the Fluval earns the title of best aquarium heater at maintaining perfect temperatures. A small, but surprisingly nice addition is made by the casing of the heater. Rather than an exposed rod, this electronic heater comes with a built on guard to prevent contact with aquarium inhabitants. While this may seem pointless, tanks with snails may understand this importance. Snails will often climb onto the heater due to its minor warmth and begin cleaning the heater. However once the heaters flip on the snail starts to cook and lets go, often falling on their back and dying unless saved by the owner. I personally have lost many a snail this way and am happy to keep them all alive now thanks to this protective guard. For those still reading the final detail I have is the back mounting system. The Fluval has a triple suction cup mounting bracket that attaches to the back of the heater. For servicing and cleaning the heater can be detattched from the mounting bracket so that you do not have to reposition the heater once it is ready to be mounted again. The suction cups are fairly strong and are more resistant to warping than cheaper suction cups. Never the less keep the area under the suction cups clean to create the best holding strength possible. 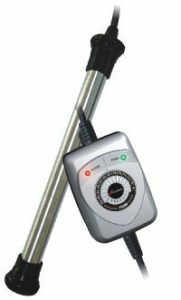 Overall the Fluval E Electronic Heater brings a lot to the table that no other heater does. The modern design and dual sensors for added safety are just icing on the cake. 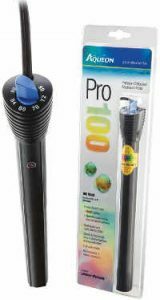 This heater is made with a durable titanium tube, making this one of the more durable aquarium heaters. Adding on the extremely convenient controller is just icing on the cake. Unlike shatter proof glass heaters, the Finnex’s titanium tube can hold up to even large turtles ramming into the tube. Owners need not worry about over zealous fish with this indestructible design. A concern I had that was put to rest was the safety of my tank itself. Given such a hard tube the heater sounds dangerous to glass tanks. However both ends are covered with a shock absorbing plastic end that prevents any collision damage and scratches. Boasting the widest range of all other heaters, the Finnex comes in 6 sizes ranging from the standard 50 watts all the way to a massive 500 watt size. That’s a huge range that covers 10 gallons all the way up to 120 gallon tanks. The controller on this heater allows you to easily adjust the heat without having to reach into your tank or dabble with your sump. The controller has large, 2 degree increments shown with a small dial that points to where the heat actually is. Not the most precise setting but its still easy to get the temperature within a .5 degree range. The red light indicates when the heater is on while the green light shows that your temperature has reached the desired setting. The warranty is a bit shorter on this one, however Finnex is well known for their quality aquarium products. If there are any faults with your heater initially send it back immediately! When these heaters work they work amazingly but nothing can save faulty parts or shipping damages. If the product does happen to fail within the 6 month warranty, Finnex will either service or repair your heater. If the heater outlasts the 6 month warranty it is unlikely to be one of the defective heaters and will live to see an average lifetime of four to five years. Combining ironclad durability, longevity and a handy controller all at a decent price easily makes the Finnex a contender for the best aquarium heater. A perfect balance between price and functionality, the Hydor Heater Theo model earns its spot here as the fourth best aquarium heater. Going back to the glass tubing style, the Hydor comes with a large, easy to read red dial top. The arrow points to the temperature setting. Simple, easy to use and more precise than knobs. Underneath the temperature setting dial is a large, multi layered rubber cover. While it is rare to be shocked by heaters, it can happen. These extra layers make the Hydor much safer in that sense. Because the all black and silver color of this heater I have been able to use it in many tanks who don’t want the heater to be a distraction while not adding on additional bodies of water such as a sump. Remember that you can set the heat before you put the heater in the tank, meaning you don’t need to touch the dial after submerging and hiding the heater. A small, but incredibly nice thing I noticed with the Hydor is the strength of the suction cups. While heaters, power head and submersible filters all can end up falling off the glass, the Hydor has exceptional suction strength. The Hydor also comes in 7 different sizes, featuring the smallest size on this list. 25 watts to 400 accommodate all tanks within the range of 2 to 105 gallon tanks. There is an exception to this heaters power however. Many have noted that the heater is not suited for large temperature changes, making cold houses look elsewhere. For many of us who keep our homes at or above 70 the heater will have no problems, but getting over the 14 degree change line can require multiple heaters. This is well documented in the user manual, which of course cannot be read until the product is in your hand. For those who leave the heat off and allow their homes to reach 65 degrees other heaters may be required. The warranty spans across two years, easily enough time to see if you have a bad heater. Those that out last this warranty will often see a life time between 3-5 years. For those looking to buy be sure to measure your tank and think outside the box a bit. If you have an external body of water and need anything smaller than the 50, we suggest getting the 50 watt anyway. It has the lowest price even though it is not the smallest heater. Not only will this save you a bit of cash but the added wattage will be a safeguard against extreme cold where a higher wattage is needed. This heater has something most heaters lack today. An older, more powerful look made from its original manufacturers in Germany. It works perfectly and had some newer features such as shatter resistant, special laboratory glass with a heat shield and crevice free design. This means livestock will not be harmed when touching the heater and large fluctuations in temperature will not harm the heater. Additionally the Jager aquarium heater features the automatic shut off when dry function. This clearly is Eheim’s candidate for the best aquarium heater for both large tanks and small tanks. Despite the aged look of the Jager this heater comes with automatic temperature regulation that shuts off the heater once the desired temperature has been reached. Additionally the thermo safety feature is standard and prevents damage when the heater runs dry. The Jager comes in sizes of 25 to 300 watts, allowing for tanks between 2 and 260 gallons to pick up a single Eheim Jager aquarium heater and be fully heated (no joke, check out their manual under downloads if you don’t believe me). Homes with low temperatures will need extra heating. 78 degrees is my dream house anyways. A lot of people disagree with me there however. If you have large temperature changes in a big tank you will need a second heater. Position the second on the opposite side of the tank and provide both with good flow for the best results. With the old look comes the old standards. Seriously the Jager aquarium heater is built to last, surviving over five years in one of my reef tanks. During this time the heater has had multiple rocks fall upon it (looking at you pistol shrimp) without receiving a single scratch. Honestly the cord would probably be yanked from the socket before the heater breaks. Should the heater actually manage to be broken you may contact EHEIM as they give a three year warranty on their products. If durability is your primary concern this is the heater for you. It is the most reliable aquarium heaters on the market. For peace of mind I highly reccomend the Ehiem Jager aquarium heater. This heater is a plain and simple, fully submersible heater with a hardened glass casing. Affixed to the front of the heater is its built in thermostat that quickly adjusts the heater to match your desired settings. This is set by turning the knob at the top of the heater, which slides the red bar sideways until it reaches the end and continues on the next level. whether the device is on or off is indicated by a small light at the top of the thermometer. The sizing of these heaters ranges from 50-300 watts again, allowing you to use these heaters for any sized aquarium equal to or greater than a 5 gallon all the way up to 80 gallon tanks. Basically if the heater fits in the tank it can function safely. 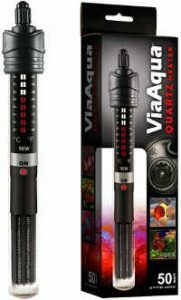 The ViaAqua comes with 2 suction cups, allowing for free style placement that holds under strong water flow. While the box warns about being placed horizontally it has actually only received that warning due to a few owners turning the heater and causing the wire to become taut. This removed their drip loop and shorted their socket as any water would normally do. Just be sure you keep your drip loops in place. If one heater breaks and stays on permanently it will not have enough power to cook your fish. The other heater will shut off normally, maintaining a safe temperature while giving the owner time to discover the other broken heater. Conversely if one heater breaks and no longer provides heat the tank will be kept warm by the other heater. Again this gives the owner a much larger window of time to fix the problem and keeps your fish, corals, and invertebrates alive. Over all this is one of the best aquarium heaters for 10 gallon tanks as it has far surpassed its expected value vs price ratio. Even Generic brands at local stores cost more for lower wattages. While I usually stick to big tanks this is likely the best aquarium heater for small tanks. Truly a lot of value has been packed into this little heater. Just take normal safety precautions as with any heater. I know this has been a lot of information for something that can be seen as a simple matter. While it is true you can throw any heater in your tank and it will probably work our fish and corals can be expensive and deserve the best aquarium heater we can find. If not for your tanks at least for your peace of mind. Looking for information on sizing your aquarium heater to your tank? read on at http://freshaquarium for an easy to read aquarium heater size guide. Also be sure to check out my page on quiet aquarium powerheads. This entry was posted in Equipment, Heaters on May 4, 2018 by Joshua@themandaringarden.